Pensacola Symphony Orchestra performed a great family event Saturday May 19, 2018. I’m so glad we were able to go! Music for families was an amazing event! 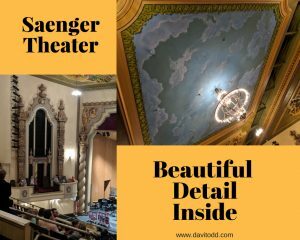 The event was held at the Saenger Theater in downtown Pensacola. We had never been to this theater before. The details of the inside were beautiful. Blue’s Angels music store was one of the sponsors for the event. I really love the Blue’s Angels music store. They have a really awesome guard parrot that lives in the store. They also have fish tanks that look like drums. The atmosphere at Blue’s Angels is really relaxed and enjoyable. The staff there make it a great store! Blue’s Angels has a lot of teachers available for all types of instruments as well. There is also a nice selection of pianos in their show room. Cox and Wendy’s were also sponsors. I’m glad these two businesses teamed up with Pensacola Symphony Orchestra to bring this entertainment to us. We absolutely loved this idea! The petting zoo was a place the children could visit nearly every instrument in the orchestra and learn a little about how it makes sound and give it a try on their own. Each instrument was accompanied by a member of the Pensacola Symphony Orchestra. My DD went straight for the piano! She’s been playing for years and she’ll play it any time she has a chance. They had a nice black babygrand piano on display for all of the children to use. Sneetch 2 went for the cello. 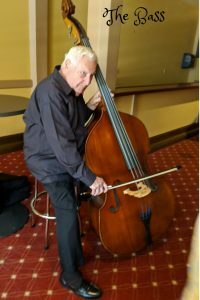 He was recently given a cello by a nearby church to learn on. YoYo Ma is one of Sneetch 2’s favorite musicians. The man at the cello station gave Sneetch 2 a little mini lesson on the cello and we watched him play a few notes. Violin and Viola were also on display. Viola is my personal favorite! It plays the alto and has a warmer more homey sound. It’s like the violin’s mom. Sneetch 1 didn’t go with us but he prefers the Violin. Violin is just so stereotypical though! Hahaha. You know you love someone if you let them practice those high E string notes on violin in your house. We had to take a look at the Bass. I’m not sure if some of the kids were just done looking at it or perhaps intimidated by it’s large size. We have a Great Dane and the bass is bigger than he is! We really enjoyed talking to the man giving the demonstration. He let all of us play it and then he even played us a little song, Mary Had A Little Lamb. They had an entire room of winds as well. We went there and saw the Tuba, Basson, Flute, and Trumpet. The lines in this room were also long. They did clean the mouth piece after each use but, my kiddos just couldn’t bring themselves to blow on a mouth piece that had been used by 15 kids while we waited. Perhaps my days of nursing school rubbed off on them! 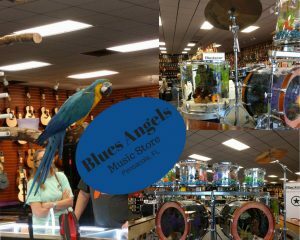 One of our favorite attractions was the percussion demonstration that the Blue’s Angels music store staff put on in the “instrument petting zoo”. There were several different types of drums set up, maracas, and tambourines. The girl that lead the demo taught us different beats. The big drums got to bang “ham and cheese”, the smaller drums beat a “run for-est run” beat, and those of us with tambourines and maracas shook to a beat of “pea-nut but-ter”. Once we had it down they played the song “Happy” and we tried to stay on beat! This was absolutely hilarious with about 30 kids in the room! After all the time in the petting zoo was over, the Pensacola Symphony Orchestra played a concert for us. The maestro, Peter Rubardt and a woman named Nicole talked to the audience about how instruments produced sound. The concert had a “music train” that the conductor (Peter Rubardt) drove Nicole around on. They pretended to look for all the members of the Orchestra. Those of us in the crowd had to help “start” up the train. On the floor level half of the people stomped feet to a beat. The other half of the floor level audience chanted “chugga chugga”. Those of us up in the balcony made the whistle sound of “woo woo”. It may have been a little corny but, I loved it! When they got to Drumland, Nicole and the conductor introduced us to the “mayor” of Drumland. He gave us an overview of all the instruments in the percussion section of the Orchestra. Lots of people enjoy the drums but I think my favorite has to be the triangle. The triangle reminds me of the ‘wild west’ where I’m from (west Texas that is). Once we were all familiar with the instruments that fell under the percussion umbrella, the three guys playing percussion played a short little song. I had no idea that composers even wrote songs for only percussion! It was neat to see. Nicole acted as though she thought only the drum section was the entire orchestra. The conductor told her that he felt there were a few more people in an orchestra. They hopped on the train again and found Brassburg. Brassburg was home to the tubas, trumpets, and all those horns. The mayor from Brassburg was a tuba player and he told everyone about the brass section. One interesting thing this mayor mentioned was that the sound for these horns first starts with the way you buzz your lips! I did not realize that the lips had to buzz to make the correct sound. I’ve always thought it was like a flute or something and you just blow on it. Once again we were treated to another song. This song was brass plus percussion. The next stop on the “music train” was Woodwindville. This section of the orchestra had bassoons, flutes, and oboes in it. This little town had our first female mayor! She played the bassoon. Once we were educated on this section of the orchestra, you guessed it!, we got another song! The flutes really added to the music. I enjoyed those a lot. The last stop on the “music train” was the string city. This is my favorite! Our family really gravitates toward the strings. I’ve got a small YouTube channel showing my progress as I learn both violin and piano. I’ve also got this article here about learning to play as an adult. The mayor of String City played the bass but he said he got elected mayor due to his vow to bring the viola back! I don’t have a viola yet (hence learning violin instead) but I cheered loudly while the four violists held up their violas! At last we had the entire Pensacola Symphony Orchestra assembled. It was time for the full effect! The Pensacola Symphony Orchestra played a mash up of all the songs in the Disney Beauty and the Beast film. Nicole had picked this song for everyone. Once this song was over she asked the crowd what song they would like to hear next. Everyone luckily shouted Star Wars, which was already on the program! This was a great program for kids and their families! People were excited to hear the wonderful live music and everyone was polite and courteous no matter how loud the babies were. We had such a great time we will definitely be back next year! The best part was, the tickets were a mere $5 each. You can’t go to a movie theater for that folks! Your brain is certainly not going to be as engaged during a film either. Lastly, your kids may never get to see and touch that many instruments in a single day! These are affiliate links. This means if you choose to make a purchase, I will earn a small commission on this sale at now cost to you. You don’t have to make a purchase. If you do choose to make a purchase, it helps keep this website free. 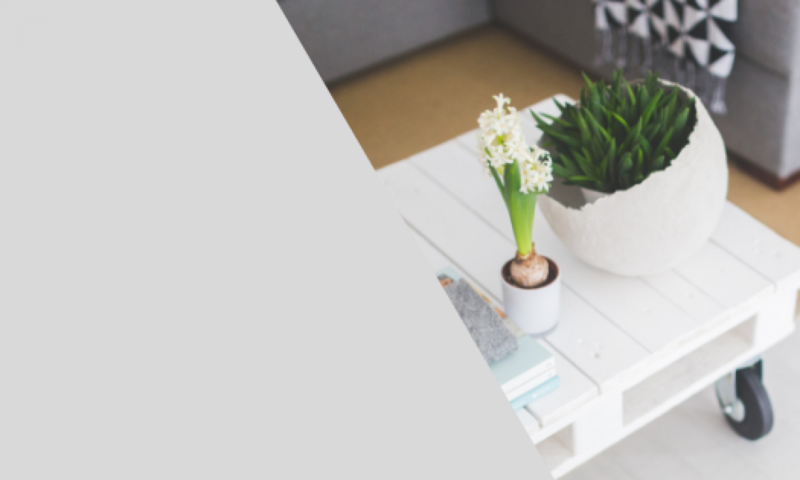 If you’d like to play some classical music at home, click here to buy some virtual sheet music. They have 4 levels of sheet music to choose from for virtually any instrument you can think of. It’s not purely classical either, they have all types of music. These picks were developed by Eppo Franken in 1984. I haven’t tried these yet but, I’m so looking forward to getting a trial set. I last purchased these picks from Amazon. These are okay but the thin ones broke over time and they are slippery if your hands get sweaty while playing. I can’t wait to see how the chicken picks compare! Thanks so much for stopping in today! If you’re planning a vacation to Pensacola or live within driving distance, I hope you’ll consider watching the Pensacola Symphony Orchestra! February already has a tendency to ‘zoom’ by so to speak; it does have only 28 days after all. Our winter camp meeting also takes place every February for a full week and immediately following this, the music festival at our local college happens. This camp meeting was especially wonderful for me as one of my dearest friends came with her family to stay with us during the meeting. It was a great time of fellowship! Music Festival was February 10th and they added the strings to the performances this year. This meant violinists could showcase their talent as well! In past years, piano and voice were the main events along with a theory written test. All of our children received the highest scores possible on their pieces. Our youngest son (who performed on piano even though guitar is his primary instrument) was given a 3/4 size cello by his former teacher at the event! He has prayed for one since last June so needless to say, he is very excited! February 13, 2018 a sweet elderly lady from our church passed away, days after her 84th birthday. She will be greatly missed! We had a wonderful graveside service for her. The Lord made a great day for it the following Monday. Clouds kept the sun off of us, there was a gentle breeze, and the ambient air was a great temperature. Mrs. Hoffman was a genuine lady with a heart full of compassion. One year, my husband was between jobs and she made sure that each of our children had a nice Christmas gift on Christmas morning. We hadn’t said anything to anyone about our Christmas plans and teach our kids that Christmas is about sharing Christ more than getting a gift. They had great attitudes even knowing Christmas would be a small affair. God used Mrs. Hoffman that year, 2011, those gifts are all still found in their rooms today. All of these events have really kept me on my toes and out of my computer chair. I’ve been keeping up music practice both at home and at church and started learning the key of “F” to my practice last week. So far, I’ve only done “C” and “G” on piano. I have dabbled a little bit on violin as well in the key of “A” but this needs a lot of work. Oddly enough, bowing a violin or cello “feels” much more natural for me than strumming a guitar. It kind of drives me crazy actually! I’ve invested a lot of time in guitar heretofore and it still feels a tad alien to me. Have you heard something similar? I know I have, in fact, most of my life I heard that musical people come from musical families and it is a genetic thing. “Either you’re born with it, or you’re not!” That is another thing I heard all the time. This comment always puzzled me since babies are not born speaking English or German, or any other language, they are taught how to speak the language by their parents. Growing up on a ranch I also saw my fair share of calves being born. They do walk pretty quickly but, they don’t just start off amazing at it. In fact, I bet if they didn’t need to learn so quickly so they could reach for food, they may take a few more days getting better at it because they fall a lot on that first day. In 2010 I began a real struggle on the inside. I desperately wanted to learn more about music and how to play at least some of it. However, I was paralyzed by fear and of the lie I had been conditioned to believe. I was taught, whether on purpose or not, that music was to be reserved for only certain people, those who were born with a natural God-given gift that I was most certainly not given. More over, I believed that adults could never learn music, learning music was only for children, special children, of which I was not. These lies I believed choked my desire to learn, I would find myself wandering through a book on music in an emotional tirade thinking I was not good enough or smart enough to understand any of the concepts outlined. TED talks to the rescue! I’m pretty thankful for YouTube as silly as that may seem; I found TED talks on YouTube when looking into the possibility of an adult learning to play music. Adults have fully formed brains and if we didn’t learn music as a child, our Corpus Callosum is smaller; therefore we can not learn music because it requires a LARGE Corpus Callosum! Well, thankfully, this may not exactly be the case, you see as much as human knowledge has improved (we think anyway) there is still much to be learned about the brain, thyroid, and well just the human body in general. Watching TED talks gave me hope that 1) learning never has to stop 2) an adult brain can adapt and learn new pathways at least some and 3) proper nutrition has more to do with brain function than ever known before. Jonathan Harnum wrote a book, The Practice of Practice and it really changed my view on my ability to learn this new skill, music. I highly recommend that you read it. 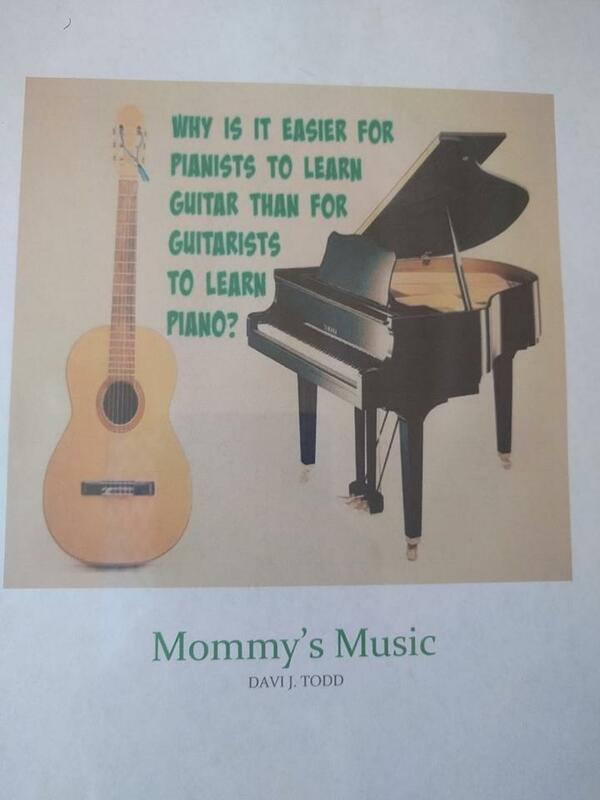 Obviously, I may never be as good as my children since they started music at a very early age but that doesn’t mean I can’t be good enough to play quite a few songs my friends and family enjoy! Every week I try to set aside time to practice, that is really the biggest detractor from adult learning, you know, all those responsibilities. We all run around chasing kids, pets, trying to keep order in the home and still maintain some me time. Now that I know I can learn music, I actually find it truly relaxing to play the portions I do know well. Now, while I’m learning a new concept and creating a new neural pathway in that gray matter, it is work! Sometimes I even think I feel a heated “tar” being laid over asphalt in my brain, so don’t be fooled into thinking adults can learn music means it is easy. However, it’s work that I love! I know that I’m fulfilling a life long dream of finally learning piano and violin! I’m helping to keep my mind sharp and giving my brain power up for later on in life in the event I do suffer from a stroke. Exercising my brain with music is building alternate routes for the future if I ever need them. Moreover, I know that I am currently making a joyful noise for my Lord and Savior and one day, one day, it may even be played skillfully for all of you to hear! Psalm 33:3 Sing unto him a new song; play skilfully with a loud noise. My DD made me this cover sheet for my music binder. I can tell you she knows I struggle on guitar! She just thought this cover would be so funny. HaHa For some reason both piano and violin just click in my brain better. I’m pretty sure that brain signals crossfire when I pick up a guitar. I know what I’m supposed to do with a guitar but for the life of me I haven’t been able to make it click into place. Sneetch number 2 on the other hand is a natural guitarist. He loves it, is largely self taught, and can also play piano! He doesn’t enjoy piano as much but he plays it well and if he loved it like he does guitar, I’m pretty sure he’d be just as good on one as the other. It’s already difficult for those who don’t listen to him daily to tell which was his first choice instrument. Now he wants to start flute as well. You can be assured this house is rarely quiet unless we are all sleeping. I hope that this inspires you to at least consider picking up an instrument and fiddle with it. I’ve got a couple of videos, albeit very amateur ones of what I learned in the first 3 or 4 months of practice. I need to make some more since I’ve learned a tad on the violin since then. My Music Progress 1 My Music Progress 2 I’m almost too embarrassed to even show these videos but, everyone has to start somewhere! I’m even more embarrassed that I’ve only made 2! My hope is, by documenting the change over time, someone can click through and see improvement and be inspired to at least give it a good college try! Let me know in the comments below if you play or think you may now!